Spring break is here. This means that you will have plenty of time off to enjoy a wide range of fun activities. And if you want to spend your vacation in style, why not come out and see us? If you’ve ever wanted to reconnect with your roots, roller skating is a great way to do it. Come on out to our different locations in Hudson, MA and Tyngsboro, MA and enjoy a night of fun activities. Roller skating is a great way to stay active while enjoying a full night of summer fun with friends and family. Spring break is the perfect time to show off your roller skating prowess. If you really want to enjoy a full night of fun activities, set your sights for Roller Kingdom. We can offer a night of exciting activities that are much more than just nostalgia. Roller skating has come a long way in the past few years and is now more fun and involving than ever. And, of course, there is plenty more to do than just skate. We can give you and your family a night of fun that you are sure to remember for many years to come. There are a million ways to spend your time during spring break. But if you really want to start your warm season off right, why not go roller skating? We have a full range of fun activities available for you and your family. You can relive your own youth with a fun night of roller skating while also keeping fit. Meanwhile, you can introduce your kids to one of the most exciting summer activities known to man. It’s a great way to bond with your kids while enjoying a night out on the town. Have you got an occasion for a party coming up? Whether it’s a birthday, an anniversary, or a spring break celebration, we’d love to host you. Roller Kingdom has several different locations and a full range of fun activities to offer. You can spend the night feasting, roller skating, playing laser tag, and enjoying yourself to the max. Now is the time for you to check out what we can offer you. Call us today to get the party started. Have you had enough of the cold weather blahs? It’s time you found the formula for winter fun. You can get your groove on with some good old fashioned roller skating. But this isn’t just reliving your past. We’ve got a fresh handle on this classic pastime that will knock your socks off. Roller Kingdom has two fantastic locations at Tyngsboro MA and Hudson MA. If you’re looking for fun for your entire family, these are the two classic venues you need to know about. When it comes to hosting fun-filled birthday parties, no one beats us. Who says birthday parties have to be boring? Sure, it’s fun opening up presents if you’re the guest of honor. But what about everyone else? What if some of them are on diets and can’t eat cake and ice cream? The party atmosphere can die down fast if you don’t have the perfect activity to keep everyone involved and having fun. This is where we come in. At the Roller Kingdom, we have one mission: To keep everyone on their feet and having the time of their lives. We host the ultimate fun-filled birthday parties in Tyngsboro MA and Hudson MA and it’s time you knew about it. If you’re sick of boring, joyless winter “events”, try us on for size. Your prescription to cure the winter blues is here. Instead of spending the evening staring at your cell phone or TV, why not do something active and exciting? Get the family out for a night of roller skating. This is one activity that you and your kids can share. Bonding with your loved ones was never so much fun. Keep in mind this isn’t some boring “retro” exercise. Our skating rink is safe, filled with activity, and fully up to date. Skating at our rink is a high energy activity that will give you plenty of exercise along with great family memories. Instead of sitting around being bored, it’s time to get on your feet. Roller skating is a fast, fun-filled, and family-friendly activity. It’s not just for kids, it’s fun for everyone and we’re out to prove it. Come down to either of our locations in Tyngsboro MA or Hudson MA and see for yourself. How long has it been since you last went roller skating? You may think that this is just one of the many things you have long since outgrown. But why give up on something that brings you so much pure innocent fun and joy? There is no reason why you can’t continue to celebrate in a true winter fun atmosphere. If you happen to live in Hudson MA or Tyngsboro MA, there is a great place where you can rediscover the fun you have always had. If your last few winters haven’t been filled with fun, now is the time for you to do something about it. You can visit a great roller skating venue called Roller Kingdom. And once you do, the first thing you’ll discover is that skating isn’t just for kids. It’s a fun filled activity that will give you a good workout and put you back in touch with your fun loving side. And, of course, you can bring your kids in order to introduce them to this healthy pastime. It’s a win-win situation for everyone concerned. Don’t let anyone tell you that skating is old hat. This isn’t some retro passion that only old fogies enjoy. On the contrary, skating is just as much fun as it ever was. It’s even drawing a whole new audience of young people who are finally discovering an activity that is just as fun – and more rewarding – than staring at their cell phones all day. You should be doing everything you can to encourage them, including having some fun yourself. The time for you to rediscover your passion for skating is now. 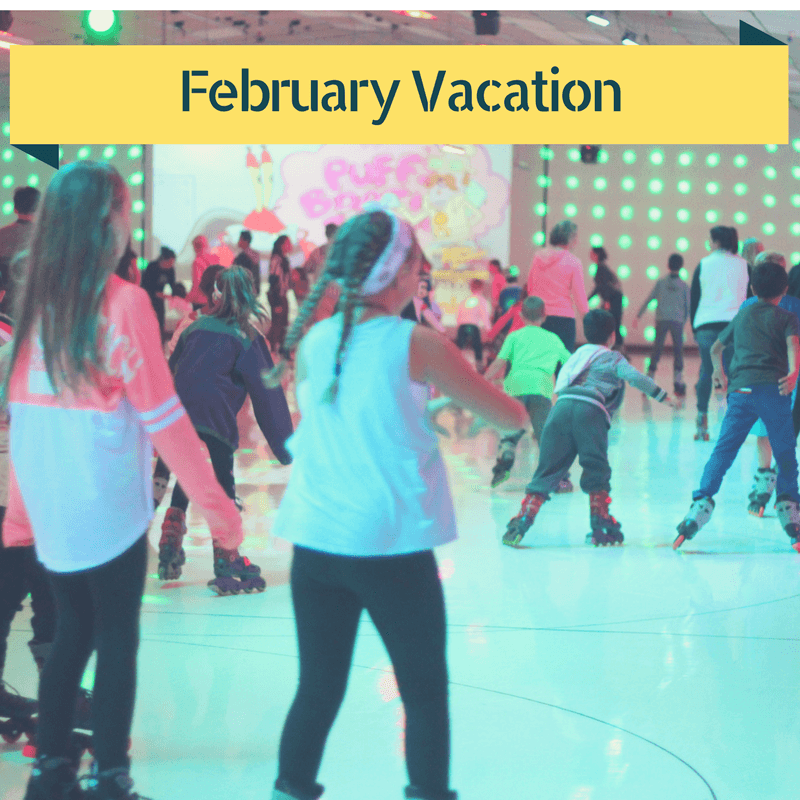 Whether you are celebrating birthday parties, anniversaries, or a thousand other fun filled occasions, one thing is clear: February Vacation Skating is the place to be. You can visit either of our two locations in Hudson MA or Tyngsboro MA to learn more. Now is the time to let your hair down and rediscover just how much fun you can have skating in a safe, exciting location. Get in touch with us today or just come on down in person and get ready to join in the fun. Parents that enjoyed roller skating at their local indoor skating rink often don’t realize that their kids too might also love this fun activity. These days, kids of all ages can participate in skating by taking advantage of the various skate sessions geared for their particular age group. Young toddlers holding their parent’s hand and teens wanting their own skating space can all find a time to practice their desired skating techniques. Many parents are concerned about how much time their children spend parked in front of the television or glued to their electronic devices. More parents are looking for healthier pursuits for their kids to enjoy. Kids that know how to roller skate can stay active all year long no matter what the weather is outside. Parents looking for innovative ways to encourage their children to take a break from their sedentary electronic devices and do something active can take their kids skating instead. Skating is again becoming a popular activity both for kids and older adults. 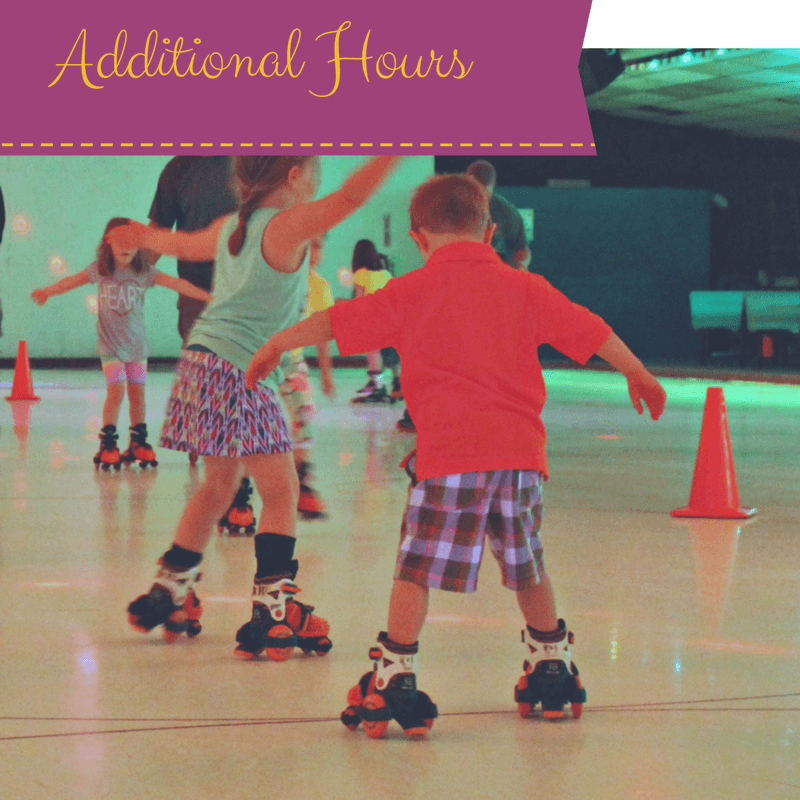 All ages can learn how to skate with rollerblades or skates in an indoor rink that is kept air conditioned for super summertime fun and warmer during the brutal cold winter months. Roller Kingdom remains a favorite destination for teens to hang out after school and on weekends. Parents too can have summer fun either skating with their families or meeting up with friends. Busy parents often become overwhelmed when their kids birthdays approach. Instead of spending a ridiculous amount of time and money finding the perfect birthday party venue and decorations, parents can simply book their upcoming child’s birthday party conveniently at Roller Kingdom. 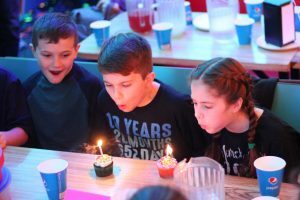 Simply reserve a time slot, opt in or out for yummy party food choices, add any desired extra party selections like laser tag, group skating lessons, various skate games and even special music requests. The convenience, low price, large or small group options and the no-need-to-cleanup after party realization has many parents planning their children’s birthday celebrations at the air conditioned skating rink. Skate purchase and rentals are also available. Contract us to learn more about amazing indoor skating summer fun. Here’s A REAL SHOCKER About Roller Skating. Kids Love It And It’s Amazing For Summer Fun! Lots of parents remember loving to skate when they were young. Today, this indoor pursuit is still drawing many excited children throughout the year. 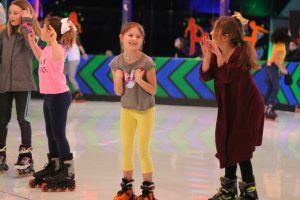 While skating in air conditioned comfort makes this activity an amazing summertime fun adventure, parents realize that roller skating is something that their kids can enjoy doing during the school months as well. Finding something that both parents and kids agree on is rare. Parents can even sign their kids up for enlightening skating lessons available right at their local skating rink. Lots of parents despair that their kids are not getting enough active exercise in this age of electronic and high tech devices. It is not unusual for kids to plop in front of the television screens to passively watch various programs. Getting your children to unplug from their devices often is met with grumbling and unhappy faces. An easy way to motivate your kids to get up and move is to simply take them to roller skate. At What Age Can I Take My Child Skating? Kids of all ages take to skating every year. Typically, younger children in elementary school are terrific candidates to learn how to skate. Even preschool aged children can learn some skating basics if they are carefully supervised and helped by an older teen or parent. It is never too late to learn how to roller skate. Older teens and even grandparents are discovering the joys of skating to their favorite style of music. Parents can find out if their local skating rink offers skating lessons. This is one activity that the whole family can enjoy. What Style of Skate Is Best for Kids? 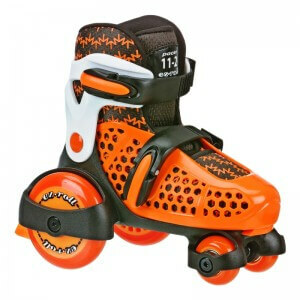 Skates come in a wide variety of designs and sizes. Before purchasing a pair of skates, talk with someone with experience in picking the right skates. Many parents opt to rent skates offered at the skating rink rather than buying an expensive pair. It is important to have the child’s foot accurately measured for a better fit. Most younger children do well with traditional roller skate designs. Older kids and teens often prefer to use inline skate styles. Enthrall your kids with a shocking new summer activity that is affordable and requires little parental effort. Contract us to discover more about summertime roller skate opportunities. Halloween should be filled with candy, costumes, and a few spine tingling scares. At Roller Kingdom, we’re hosting an exciting Halloween party for skating lovers looking for an exciting night out. You’re cordially invited to celebrate the most fiendish of holidays at one of our Massachusetts locations. Halloween is nothing without a good costume. At Roller Kingdom, we want to see you decked out in style. If you show up in costume, you’ll get free candy and a chance to win our costume contest. Three people with the best costumes will win free skates, a free year of admission, or both. If you want to win, start brainstorming now. Not feeling like dressing up? No problem. When you come to Roller Kingdom for a Halloween celebration, expect more than costumes and a fright-filled playlist. We’ll also have a number of fun party games. If you have an eye for size, make sure to play our Guess the Weight of the Pumpkin game, where contestants have to guess the poundage of an oversized pumpkin. Anyone with a sweet tooth should swing by the Munchkin Eating Contest. Show off your eating skills by downing as many mini-donuts as you can. We’ll have a ton of other fun things to do as well, so make sure to come to one of our two locations on October 29! Eating candy may be the most beloved Halloween pastime. After you’ve eaten a few too many mini-size chocolate bars, hit the rink for some calorie burning exercise. Skating gets the blood pumping, which means it’s great cardiovascular exercise. It also helps you burn calories fast; adults can expect to burn about 300 to 600 calories in an hour, depending on height, weight, and gender. It’s a great mood booster, it improves balance, and it builds strength in the arms and legs. Our roller skate Halloween party is the perfect way to jumpstart your post-Halloween diet. At Roller Kingdom, we love hosting parties of all types. Our Halloween party is being held at both locations on Sunday, October 29. It will run for four fun-filled hours: from 1pm to 5pm. We also host birthday parties, private parties, and have a monthly adult night. Our rinks are fun for people of all ages! 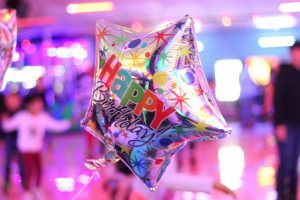 If you’re looking for the perfect venue for an upcoming birthday party, consider a roller skate rink! Rinks are a fun, active place to celebrate a birthday. Here are just a few of the benefits to hosting a skating party at Roller Kingdom. When you host a party at your home, you’re left cleaning up piles of party hats, paper plates, and birthday décor. Instead of resigning yourself to hours worth of cleanup, host your party at a skating rink. Rinks help parents prepare the party and assist with cleanup afterwards, giving adults time to enjoy the party themselves. Many parents even lace up a pair of skates and hit the rink! If you’ve attended kids’ birthday parties before, you know that eating cake and playing party games leaves them full of energy. Roller skate parties give them a chance to channel that energy into a fun-filled athletic activity. They’ll love skating around the rink to their favorite music, and they’ll get some healthy exercise too! It’s a win-win situation. We off different party packages ensuring that every customer can achieve the perfect party. Regardless of the size or scope of your party, you’ll be able to find a birthday package that suits your needs and budget. Instead of spending top dollar on birthday entertainment, decorations, etc, choose an exciting and affordable skating party. The party games played at standard parties are certainly fun, but a skating rink race beats a piñata every time. There are plenty of fun things to do at skating rinks, ranging from karaoke to Hokey Pokey. Roller Kingdom is eagerly anticipating the Winter Vacation or February Break with special skating sessions. Read on for the details you need to know at each location! 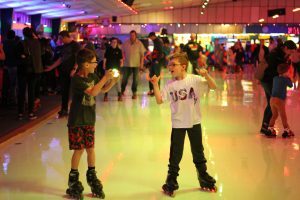 In addition to roller skating, don’t forget to check out our laser tag, arcade, snack bar, and karaoke! As we strive to put those long winter days and cold temperatures behind us, we think getting out and getting active is the key to having fun over February Vacation. With school out in Tyngsboro and Hudson, we’re opening our doors for some extra fun! As the cold weather starts to creep in, indoor activities are a great way to keep your kids active as well as a great family time. At Roller Kingdom we offer an awesome morning session that is great for beginner skaters, starting November 5th from 10am to noon. $6 Admission includes skates. Roller skating is one of the most fun things to do in Tyngsboro and Hudson, MA during the cold weather. Don’t forget to check out our amazing discounted Birthday Party packages for Saturday mornings.